Here's another nugget of ereader history that you might find interesting. If you know anything about the history of ebook readers, then you probably know that Sony have been in this industry for quite some time. 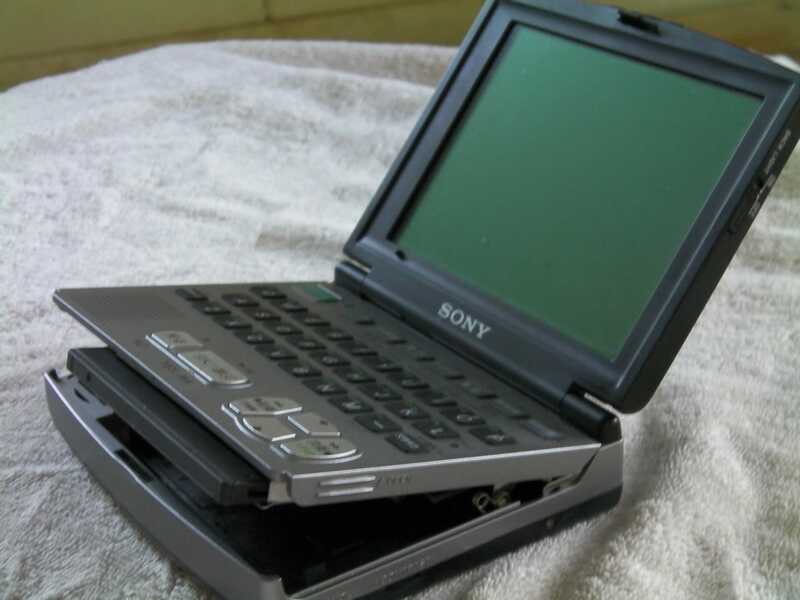 The released the first Sony reader, the PRS-500, in 2006. 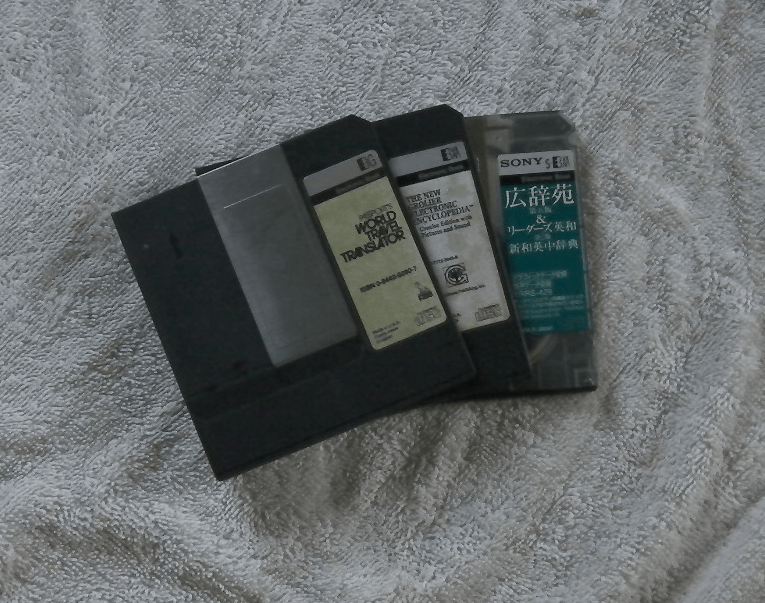 And before that they also released the Sony Librie in 2005 (only in Japan). But long before Sony released the Librie, they also released the Data Discman. Sony have been dabbling in the ereader market for a lot longer than you realize, and they actually released their first Data Discman in 1990. By 2000, Sony had released a number of different Data Discman models. I just acquired another one via Ebay. These weren't the ebook readers you'd expect today and in fact they have very little in common with most ereaders on the market. The Data Discman were conceived in a pre-PDA, pre-smartphone gadget ecosystem. This was so long ago that it even predates modestly priced laptops. They didn't have many fiction titles available, and they were also rather expensive (prices started around $400 and went up from there). The DD-S35 was one of the last Data Discman, and it was priced around 44 thousand yen when it was launched 10 years ago. Depending on the conversion rate and inflation, that would be about $600 to $750 today. The prices limited the market to those who really needed the compact format, and that probably affected the title selection. Most of the ones I'd seen were reference guides, encyclopedias, and other dense information sources. 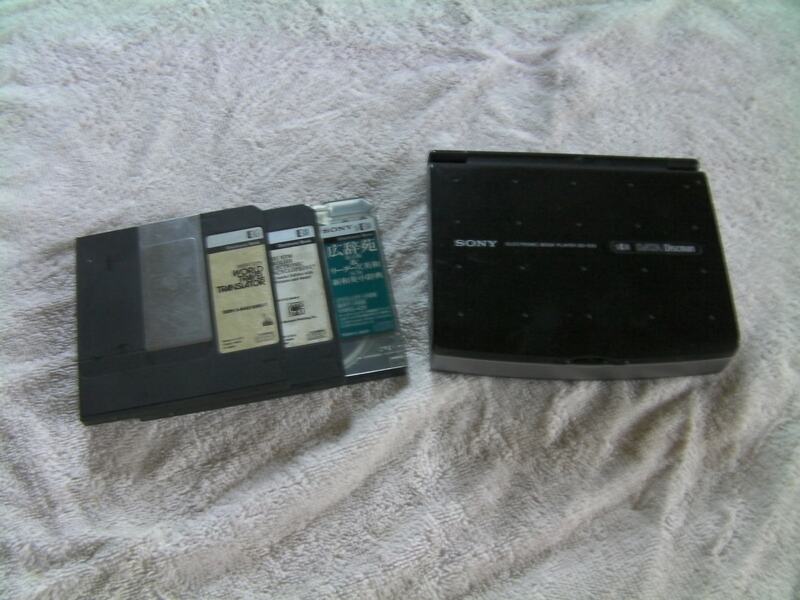 The Data Discman used a proprietary cartridge that Sony sold but inside the cartridge was a standard 3.5" CD. (No, seriously, you can still buy this CD size if you want.) The file format was also proprietary, and while the format has supposedly been hacked, I never had much success in burning my own CDs for the Data Discman. BTW, there were actually 3 (or possibly 4) file formats for the Data Discman, not one. The base format only supported text, and the more sophisticated formats had images and audio. The multiple formats made things a little interesting for end user, because the several dozen Data Discman models didn't all support images and audio. The various models also came in a variety of shapes, including slabs and clamshell. I just got a DD-S35 off of Ebay. It's not the sturdiest of the models, but it's also one of the few I have that is completely functional. It has a keyboard, a 5" LCD screen (320x240), speaker, headphone jack, and it runs off 2 AA batteries. My unit was originally released in Japan, so I'm at something of a loss to figure out what the symbols on the keyboard mean. On the upside, the DD-S35 does support the enhanced formats. At least it should; I haven't found any images or audio to test. The software is rather limited, but the hardware is quite well done. That's no surprise; according to one source I have one of the last Data Discman model that Sony ever released. It hit the market in 2000. To get more ebook reader news, subscribe to the RSS feed or the daily email newsletter. >>>The DD-S35 was priced around 44 thousand yen when it was launched 10 years ago. 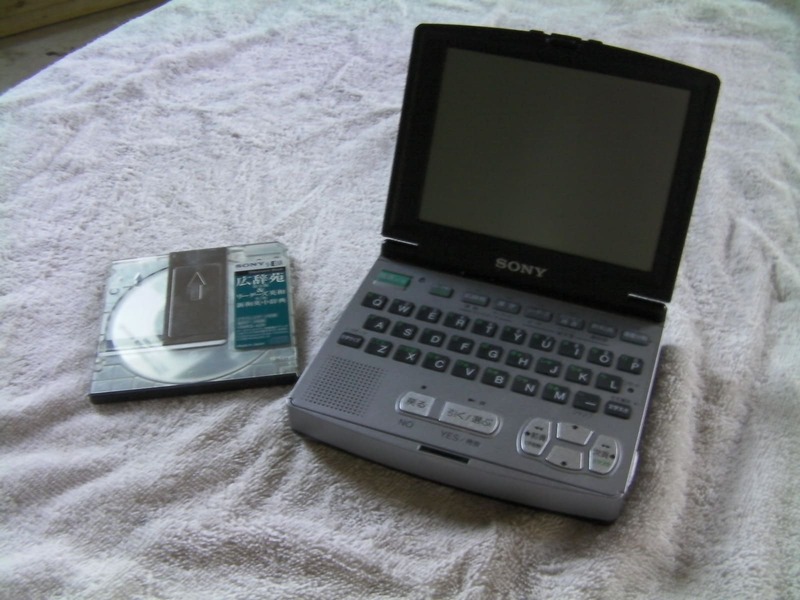 >>>A Data Discman is an electronic book device introduced in 1990 by Sony Corporation. Man, stop messing with my sense of time like that. I remember the stir it caused at the time — which was longer than ten years ago (thank you, Wikipedia, for preserving my diminishing sanity). I think the Dept of Defense bought up a bunch to use for reference manuals. If you’d read the whole post you’d see that this unit was one of the last introduced. Let me go rewrite it so it’s more clear. Yeah, that’s better. After the initial model, I don’t think anyone paid attention because it didn’t sell straight off. That’s what they tried later on with the PlayStation Portable and the UMD (Universal Media Disc?). Movies were sold for the PlayStation initially. Reading this article made me want to dig out my own Data Discman. Last time I used it a few years ago it ran just fine. This time however it just would not read any disc I inserted. I’m guessing that all the discs couldn’t have gone bad all at once so perhaps it’s the laser. That’s a pity since I held onto this as an example of very early multi-media tech. Pierre, it might not be hard to fix–probably the laser just needs to be cleaned or adjusted? Of course it probably wouldn’t be worth the cost and effort unless you’re running a museum. Hey, maybe a museum would want it! I had three Data Discmans. I still have one, and it still works.